Eleanor (left) and Sophia robes by Harlow & Fox. Photography by Kate Ignatowski. By far one of the highlights of shooting the Curvy Girl’s Bridal Trousseau editorial earlier this year was getting the chance to swan around in Harlow & Fox‘s sumptuous silk robes. At the time (April) I was outside the Harlow & Fox size range for bras and knickers, but I was so honored that Leanna Williams, Harlow & Fox’s brilliant creator and designer, lent me these two items to wear for the feature. As lovely as they look in photos, they are something else entirely in real life. Wearing these robes (along with wearing my lovely silk ruffled knickers from Angela Friedman) was my first taste of what it feels like to wear luxury lingerie. There’s really nothing that feels like silk, and there’s nothing that compares to wearing something that you feel is just PERFECTLY designed: from seams to lace placement to sleeve shape to length, there is such care and attention paid to the materials, the color (ohhh the colors are perfect), the fit, the construction, and the look that it’s really impossible to imagine anything better. I’ve seen pieces from some of the bigger luxury lingerie labels that I think are lovely or interesting or pretty, but Harlow & Fox stands head and shoulders above them for pure elegance and flawless execution. We shot all the photos for the bridal feature back in April, and I sadly packed up the beautiful robes and returned them to Leanna in England. 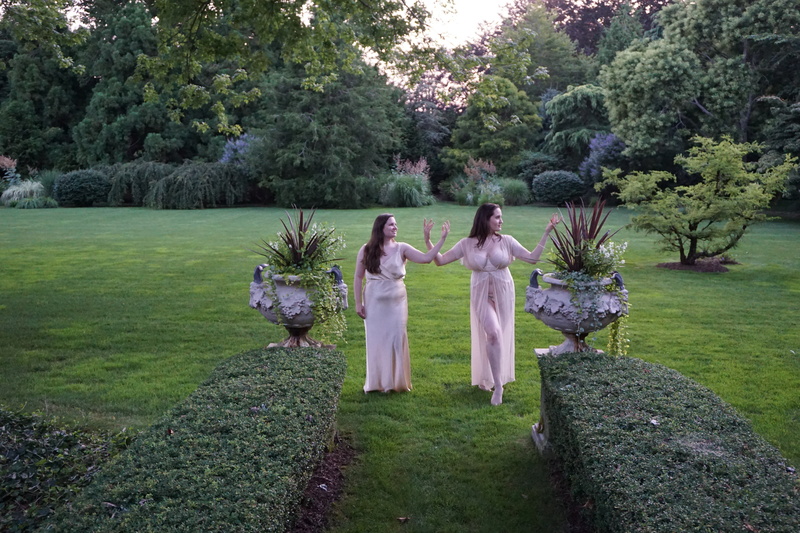 Flash-forward to August, when Leanna partnered with the talented Angela Friedman to host a trunk show in Southampton a few days after the end of CurveNY. I made an appointment to preview Leanna’s S/S15 collection during market week, and once we were finished oohing and ahhing over the beautiful things, Leanna mentioned that she’d brought a full size run of her Eleanor collection for the trunk show, and would I be interested in trying on the bra, as my size had changed since April? And that’s how I found myself being a lingerie model with the lovely Miss Underpinnings (left, above) in a gorgeous home in Southampton one sunny Friday afternoon. Yes, it was awesome. This house had actual, like, grounds. It was like being in someone’s country seat for a Jeeves and Wooster/Downton Abbey-style weekend-in-the-country, and if you don’t think that was RIGHT UP MY ALLEY then you don’t even know me at all. But back to the lingerie: while I obviously can’t speak to what it’s like to wear the pieces over an extended period of time, I did spend 5-6 glorious hours in them, and I’m here to tell you all about it. The Eleanor collection is an iconic group from Harlow & Fox’s debut season that’s since expanded to include a new colorway (the lovely mink, which Krista reviewed for The Lingerie Addict) as well as a few new pieces. The bra in the Almond colorway features soft, pale silk cups with a silk side panel to pull the breast tissue forward and a beautiful ivory Leavers lace top section. A small pearl drop sits at the center gore, and the band is made of the same silk, closing with two rows of three columns of hooks and eyes. Miss Underpinnings (who has her own set and reviewed it here) and I each wore the Eleanor bra and classic brief, which features a lovely little keyhole detail in the back. Miss Underpinnings advised that she wears her sister size (one band size larger and one cup size smaller than she usually wears) in Harlow & Fox, as silk isn’t as stretchy as some of the synthetic meshes most full-bust brands use. I found that to be the case for me as well: not only is the band a little firmer than some of my other bras, I neither need nor want to stretch it out to its fullest capacity. I did find the knickers a little on the small side: I’ve been wearing a smaller size in Freya, Curvy Kate, and Bravissimo knickers lately, but with Harlow & Fox I preferred one size up for a little more coverage. It’s been a real education trying lots of the newer full-bust brands in their first, or even second or third, seasons. I’ve also been working as a fit model with Crème Bralée as they work to expand their size range, and it’s made me realize how straight up DIFFICULT it is to design full-bust bras. There is a LOT to be considered when it comes to good fit in a full-bust bra, there are countless tiny tweaks and corrections that have to be made with each pattern adjustment, and I’ve never yet met a brand who nailed the fit right out of the gate. Until now. From comfortable wire placement, perfect strap length, adequate cup depth, and a gentle, natural lift and shape, Harlow & Fox has blown me away. Not only is the shape and support fantastic, can we talk about what it feels like to wear a bra that’s basically a soft silken cloud? No thin scratchy mesh, no exposed seams, no irritating synthetic lace: just silk inside and out, with delicate Leavers lace on top. In fact, let’s also talk about the lace, while we’re at it, and how it’s open at the top to allow room for slightly fuller breasts yet backed with a layer of mesh for support, while remaining delicate enough to provide a really beautiful neckline. Many of the guests at the trunk show were surprised to discover how smooth the bra looks under clothes: even though it’s seamed and has lace, because the fit is so good and the construction so immaculate, the bra disappears really well under a variety of tops and dresses. 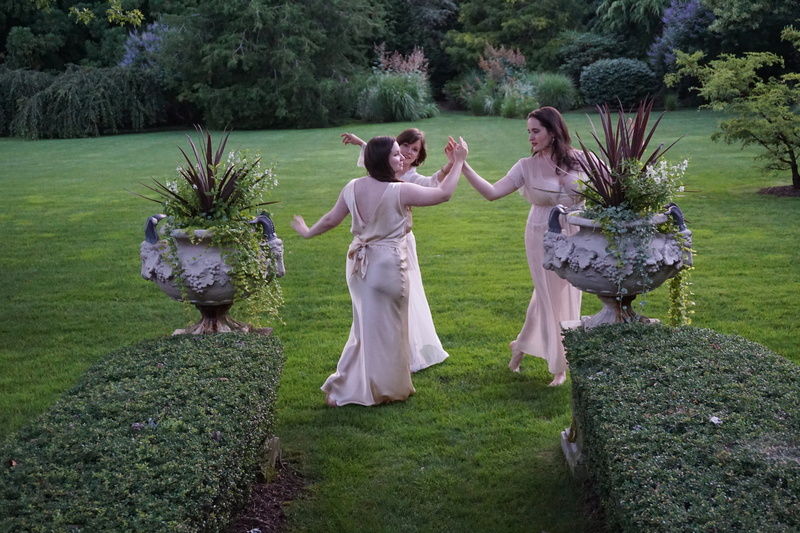 You’ll also note that we each got to wear the coordinating Eleanor robe in beautiful almond silk georgette trimmed with the same ivory Leavers lace as the bra. These robes are magical– light, flowing, and delicate, and while there’s plenty of room for busts at the larger end of Harlow & Fox’s size range (like, erm, mine), they’re designed to drape softly on smaller busts too without looking droopy. At my height (5’10”) the elasticated waist falls where an empire waist does, on shorter ladies and those on the smaller end of the full-bust spectrum, the waist might fall lower on the torso. Both silhouettes look classic and delicate. 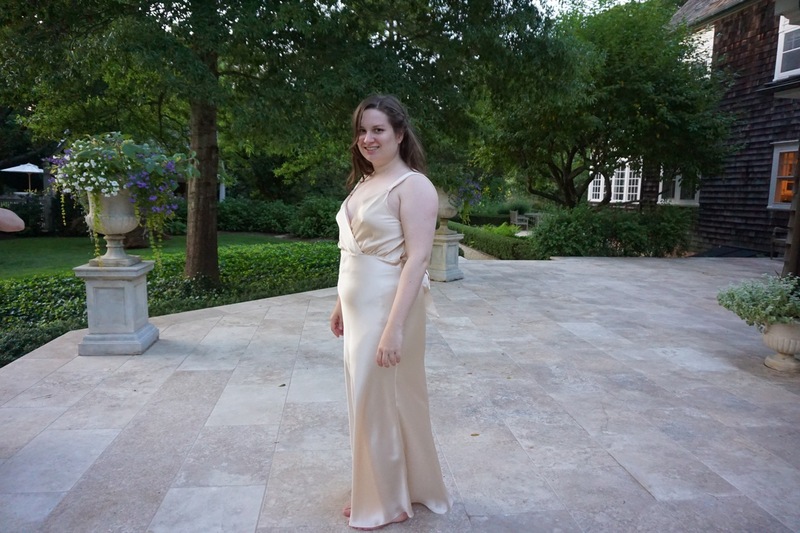 Caro of The Lingerie Lesbian models the all-silk Eleanor gown, looks elegant as all get-out. Rounding out the Eleanor collection are a coordinating thong, lace-trimmed suspender belt (gorgeous) and a long, magnificent draped-back gown (in two sets of sizes: S, M, L/D-F and S, M, L/FF-G). As I found to be the case with both the Sophia robe and the Eleanor robe, the Eleanor gown, with its clever construction and beautiful bias-cut silk, offers a bit of size flexibility and might be a great choice for someone just outside the size range for Harlow & Fox’s bras. Spring/Summer 2015 will see the launch of a new addition to the Eleanor collection in the form of a lovely, lace-trimmed half slip. I’m really sorry. This is the only picture I have of it. I was completely high on lingerie at this point in the afternoon. From corsets to sheer slips to silk bras and tasseled robes, it was an afternoon filled with some of the loveliest lingerie from two of my favorite independent designers. I kind of want these two to partner together all the time; there’s a shared respect for sophistication, elegance, creativity, and beauty throughout both designers’ work. Once the trunk show guests had left, those of us who were staying the weekend immediately began playing dress-up with the samples, and I’ll leave you with photographic evidence of our ridiculousness in closing. 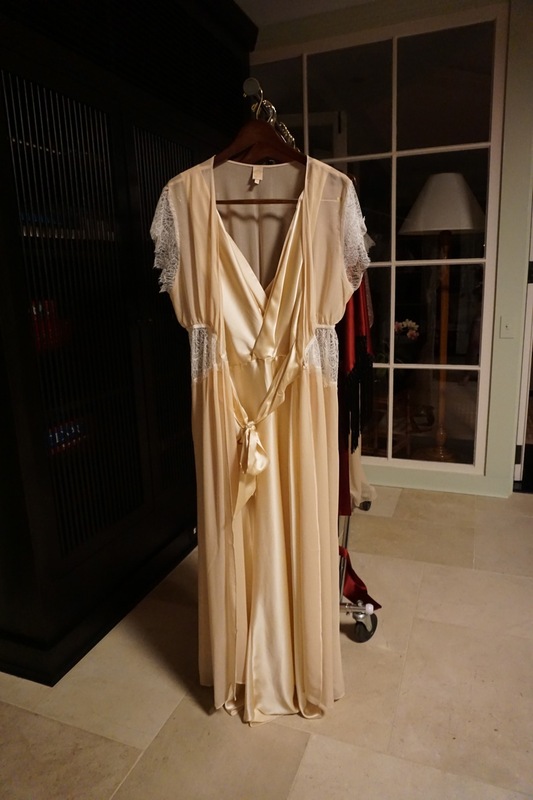 The Eleanor gown and robe, in repose. Detail of the gold lace-and-silk Viola longline collection. I was really insistent that we go out on the grass and be nymphs. I’m kind of annoying IRL, tbh. Caro was humoring me, at this point. How sad that we were forced to pose in this hideous hellscape. All photos courtesy The Lingerie Lesbian, because I was too busy admiring my own self to actually take pictures for my blog. Aw, thank you! It was such a beautiful afternoon, and I loved getting to see so many different women try your amazing corsets and lingerie! To say those pieces are stunning is an understatement. What a beautiful photoshoot, you all looked so wonderful! This post makes me swoon. Such stunning lingerie *on to the wishlist it goes* and such beautiful ladies all of you. 🙂 I really hope this brand starts to find its way into boutiques (near me) as, at the price, it really is a must try on before purchase. It’s so prettyyyy I want it aaaaall [reminds self that she is an admin, and not a lady of leisure]. I’d love to see it in more boutiques too– hopefully before too long it’ll come your way and you’ll get to try it for yourself! I am pretty sure this is the greatest blog post in existence. Seriously, you all look fabulous, and I love the pictures and review! Thank you Erica! We had such a lovely time. There should be more underwear parties, I think. I especially like seeing you and other non-models modeling the styles because it gives me a better idea how they might actually look on me- I really like the shot in this one with you posing in the exact same lingerie with Miss Underpinnings, since I can compare how the style looks on your different shapes. But it’s also just awesome seeing you are confident enough now with the body issues you have written so much about to post yourself in undies on the internet. Inspiring to all of us who sometimes worry about the same things. Thank you so, so much for your sweet comment. I’ll be honest: keeping the pictures off for so long had as much to do with privacy concerns as anything. I’ve heard some horror stories from my UK blogger counterparts, and I was wary of courting the attention of people who might be hateful or abusive. I also have a twin sister, so I had to make sure she was okay with putting “our” face out there in this capacity. Fortunately, it’s been an overwhelmingly positive experience so far, and I’m really, really, REALLY glad to hear that you find the pictures helpful. That’s what I really hoped would happen!